The drama started off rather bland for my usual KDrama taste. There was nothing catchy for its premier and it basically dragged about up to the 3rd episode but after sticking up with this drama, things started to get more interesting. The story line has picked up to a much better pace. There were more interaction between the characters and everything started to finally make sense. I was already having a fun watching it for all the humor and what-not’s until episode 12 came about. That’s when the story line drastically changed, it began to spin around senselessly aiming nowhere and it was plainly a disaster. I realized that the writers never really thought of giving a proper closure to each of the characters problems, specially on the main ones due to the cut episodes. This drama was supposed to be 16 episodes, instead they decided to make do with 14, ending up with a rubbish ending. Episode 13-14 was produced in a haste. Maybe its the production management but I have a hunch they couldn’t extend the drama up to 16 episodes due to the bad ratings, which would have given them time to put a much better ending. The story, the characters and the over all production had so much potential if only they have been developed properly. Yes, everything has been all fun and cute in the middle of the series but the ending plainly sucked. There was a lot of loopholes and never ending problems. Episode 14 had this sort of time snap where everything was cut and then here comes out the protagonist saying “everything is going to be okay” just to resolve the very main conflict in the story which is: The female protagonist pretending to be a boy in an all male K-pop idol group gets discovered, information leaked out online and chaos it is for the entertainment industry. How the heck do you resolve that in one freaking episode? Episode 14 was clearly telling the audience that the conflict was resolved, but in reality… they just don’t have the time to resolve it. Period. There… I finally got that out of my system. I don’t even like Kpop music, or Kpop Idols in general. I only wanted to watch this because of the story line: A girl pretending to be a boy for some important self-inflicted reason. Sigh. I need a better drama to watch or a movie. Rating this drama 5/10 for the sole reason that I enjoyed the middle part of the series but at the same time want to forget that I even dared watching it. Like the original series, “SPEC” will revolve around a pair of police detectives as part of a special division solving difficult cases (Mishou). Touma Saya is a woman with an IQ of 201 and an inability to “read the atmosphere” in social situations. Due to a previous case, her left arm is in a sling. 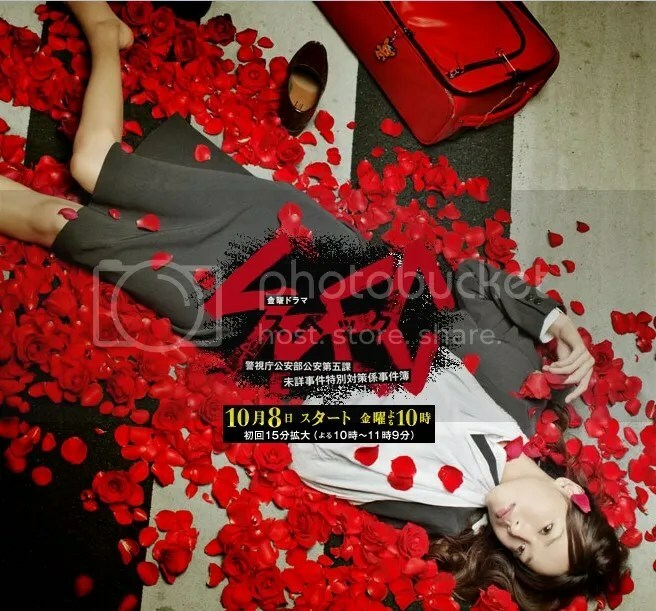 Her partner Sebumi Takeru used to be the star performer of the Metropolitan Police. After some incident however, he was transferred to Mishou. Those two track down offenders with special abilities(SPEC) who managed to get away with their crimes. I haven’t seen the 1990’s version of Keizoku Spec where this latest drama was based on, but I sure did love the latest one. Toda Erika as Toma Saya was perfect. It was like the character was made for her. She usually had cutesy or prim-proper roles but here, it was like an overhaul of every drama she did. As for her co-actor Kase Ryo (who speaks perfect English with a US accent), I haven’t seen him in a starring role and am not too familiar with the guy but his acting here as Sebumi Takeru was in perfect sync with Erika’s. The chemistry between the actors was so smooth there were no dull moments even in silence. There character had this specific peculiarities and that’s what made them really interesting. Like in Toma’s case, she has an IQ of 201 which doesn’t really define her – because in actuality she is already eccentric in the first place. She has this great feature of annoying people because of her mannerism and certain habits that are out of place to any normal person, but this does not make her insane, it only makes her different. As for Sebumi, he is the usual honor police with really good fighting skills and a really uptight person. This type of character is what would seem normal and boring, but what makes his role peculiar? It’s the way he handles situations and most of all that specific thing he always carries with him; a brown paper bag which consists of his things – gun, wallet, etc. It kind of makes me wonder why that paper bag never rips and spills all his stuff. LOL. The story line was continuous, it reveals enough on every episode to make you seat at the edge of your chair to continue on watching and ask yourself, “What’s going to happen next?” or just plainly say “WTF?! ?”, yes this is how this show was for me. There were wtf moments, but those are the times which made the show much more fun. Another boost for this drama is the fact that the soundtrack was also nice. It was kind of funky-pop-ish-rock themed sang by the band The Ricecookers. For those who are into the jrock genre, the theme song would not disappoint. As for the whole OST – it was very much appropriate for every scene. If you are into sci-fi and mind boggling suspense things with a twist of weird wackiness on the side-lines, this may suit you as it did to me. Rating this 8/10 – because though I really loved the characters and storyline, there are still limits on this drama, like the fact that there are times when the characters go overboard. I know that’s part of all the drill to make this drama more interesting but still, there’s that point in which how much of that silliness you can take in. Kim Tae Hyeon is a talented surgeon. Desperate for money to pay his sister’s medical bills, he adopts the code name Yong Pal and offers his medical skills to those in need of medical attention but who cannot do so publicly, dealing with gangsters and corrupt plutocrats. It is while making such a house call that Tae Hyeon rescues “sleeping beauty” Han Yeo Jin, a chaebol heiress, from a medically induced coma, leading to unintended consequences. This drama did own up to its hype. It made me binge watch it in one go because it was really good. However… the drama could have finished at around episode 16, but they had to milk the fame up to episode 20. It was also kind of hard to distinguish the good and the bad since the characters all have their own agenda. All throughout each episode, there’s always that gray area in between what’s right or wrong, basically it’s up to the watcher’s moral standards to decide. What I liked about the story was the complicated relationship between Yong Pal and Han Yeo Jin. If this was the typical drama trope, it would have been full on makjang stuff but no… this isn’t the usual stuff offered from Kdrama land. The story line is mixed up between a commoner doctor and an heiress who was put into a comatose state so that the bad guys could rule the poor woman’s empire, and so here comes in the lead guy whose role was to save Yeo Jin from all the baddies out there. Meanwhile, Yong Pal gets himself into a more complex situation than he already was in. All in all, it’s actually about mishaps of conspiracies and devious plots. Also, it kind of helps that the female lead is so pretty that whatever it is she’s doing, it’s too hard to think she’s scheming something beforehand. Well it’s all about survival of the fittest in their kind of world. If you don’t stand up and conquer the wolves, you get eaten. It’s dog eat dog when it comes to the rich and the famous. Music wise, it wasn’t really that much memorable for me. Even the cinematography wasn’t that outstanding, what really brought this drama to life was the storyline and characters. The actors were really good and that’s what made a whole lot of difference from the other dramas out there.